Usually sites are screened on the basis of a wind atlas, and validated with wind measurements. Meteorological wind data alone is usually not sufficient for accurate siting of a large wind power project. Collection of site specific data for wind speed and direction is crucial to determining site potential   in order to finance the project. Local winds are often monitored for a year or more, and detailed wind maps are constructed before wind generators are installed. As of 2017 [update], The Walney Wind Farm in the United Kingdom is the largest offshore wind farm in the world at 659 MW, followed by the London Array (630 MW) also in the UK. In 2010, there were no offshore wind farms in the United States, but projects were under development in wind-rich areas of the East Coast, Great Lakes, and Pacific coast;  and in late 2016 the Block Island Wind Farm was commissioned. Installation and service / maintenance of off-shore wind farms are a specific challenge for technology and economic operation of a wind farm. As of 2015 [update], there are 20 jackup vessels for lifting components, but few can lift sizes above 5MW. Service vessels have to be operated nearly 24/7 (availability higher than 80% of time) to get sufficient amortisation from the wind turbines. [ citation needed] Therefore, special fast service vehicles for installation (like Wind Turbine Shuttle) as well as for maintenance (including heave compensation and heave compensated working platforms to allow the service staff to enter the wind turbine also at difficult weather conditions) are required. So-called inertial and optical based Ship Stabilization and Motion Control systems (iSSMC) are used for that. First wind farm consisting of 7.5 megawatt (MW) Enercon E-126 turbines ( Estinnes, Belgium, 20 July 2010), two months before completion; note the 2-part blades. Europe's largest windfarm is the ' London Array', an off-shore wind farm in the Thames Estuary in the United Kingdom, with a current capacity of 630 MW (the world's largest off-shore wind farm). Other large wind farms in Europe include Fântânele-Cogealac Wind Farm near Constanța, Romania with 600 MW capacity,   and Whitelee Wind Farm near Glasgow, Scotland which has a total capacity of 539 MW. An important limiting factor of wind power is variable power generated by wind farms. In most locations the wind blows only part of the time, which means that there has to be back-up capacity of conventional generating capacity to cover periods that the wind is not blowing. To address this issue it has been proposed to create a " supergrid" to connect national grids together  across western Europe, ranging from Denmark across the southern North Sea to England and the Celtic Sea to Ireland, and further south to France and Spain especially in Higueruela which was for some time the biggest wind farm in the world. The idea is that by the time a low pressure area has moved away from Denmark to the Baltic Sea the next low appears off the coast of Ireland. Therefore, while it is true that the wind is not blowing everywhere all of the time, it will always be blowing somewhere. India has the fifth largest installed wind power capacity in the world. As of 31 March 2014, the installed capacity of wind power was 21136.3 MW mainly spread across Tamil Nadu state (7253 MW). Wind power accounts nearly 8.5% of India's total installed power generation capacity, and it generates 1.6% of the country's power. Most future wind farms in South Africa are earmarked for locations along the Eastern Cape coastline. 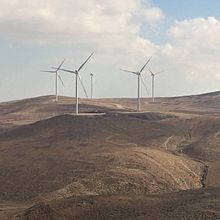 Eskom has constructed one small scale prototype windfarm at Klipheuwel in the Western Cape and another demonstrator site is near Darling with phase 1 completed. The first commercial wind farm, Coega Wind Farm in Port Elisabeth, was developed by the Belgian company Electrawinds. One of the biggest[ citation needed] factors inhibiting wind farm construction is human opposition. A study has shown  "turbine placement close to residents may heighten their uncertainty and concern of the wind turbines and overshadow any positive inclinations towards the development." Wind farm development is affected by the emphasis being primarily placed on the domain of landscape assessment and environmental impact when seeking farm sites. The viability and efficiency of the wind farm are barely touched upon, instead falling to the developer. One report in 2013 suggested that perhaps in some places where wind energy was becoming politically popular, engineering aspects, specifically energy yield are not being taken into consideration, either by the public or in the process of planning consent for wind farm development. As energy is the main purpose of wind farms, a lack of attention given to the subject could be detrimental to the general acceptance of wind farms. Livestock ignore wind turbines,  and continue to graze as they did before wind turbines were installed. Permanent problem solving include a non-initiation window to hide the turbines while still tracking aircraft over the wind farm, and a similar method mitigates the false returns. England's Newcastle Airport is using a short-term mitigation; to "blank" the turbines on the radar map with a software patch. Wind turbine blades using stealth technology are being developed to mitigate radar reflection problems for aviation. As well as stealth windfarms, the future development of infill radar systems could filter out the turbine interference. ^ " VIPs cut ribbon at 400MW Anholt" Recharge News, 4 September 2013. Accessed: 4 September 2013. ^ Jan Bjerre Lauridsen & Søren Andersen. " Queen says Good Wind to giant turbines" Berlingske, 4 September 2013. Accessed: 4 September 2013. ^ Garvine, Richard; Kempton, Willett (2008). "Assessing the wind field over the continental shelf as a resource for electric power" (PDF). Journal of Marine Research. 66 (6): 751–773. doi: 10.1357/002224008788064540. ISSN 0022-2402. Archived from the original (PDF) on 20 July 2011. Retrieved 30 November 2009. ^ Romanuke, Vadim (2018). "Wind Farm Energy and Costs Optimization Algorithm under Uncertain Parameters of Wind Speed Distribution" (PDF). Studies in Informatics and Control. 27 (2): 155–164. doi: 10.24846/v27i2y201803. Retrieved 21 February 2019. ^ a b Begoña Guezuraga; Rudolf Zauner; Werner Pölz (January 2012). "Life cycle assessment of two different 2 MW class wind turbines". Renewable Energy. 37 (1): 37. doi: 10.1016/j.renene.2011.05.008. ^ Cappiello, Dina. " 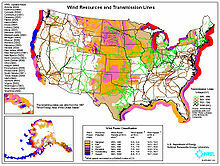 US wind farms get pass on eagle deaths". Associated Press, 14 May 2013. ^ Rubin, GJ; Burns, M; Wessely, S (2014-05-07). "Possible psychological mechanisms for "wind turbine syndrome". On the windmills of your mind". Noise & Health. 16 (69): 116–122. doi: 10.4103/1463-1741.132099. PMID 24804716.